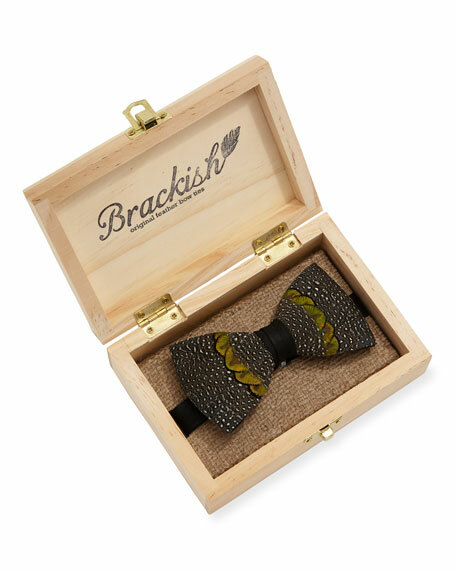 Brackish Bowties guinea and peacock feather (USA) bow tie. Feathers are handpicked, so each bow tie will vary slightly. Packaged with care instructions in wooden storage box. Grosgrain wrap at center; satin band with hook closure. Canali tie in boxed floral pattern. Approx. 56"L; 3.3" at widest. Silk; dry clean. Made in Italy. Kiton tie in circular medallion pattern. Approx. 58"L; 3.5" at widest. Silk; dry clean. Made in Italy. 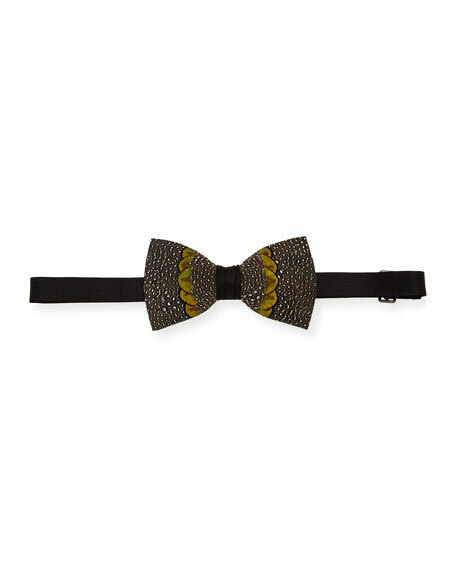 Stefano Ricci cummerbund and bow tie set in satin. Cummerbund: pleated; adjustable fit. Bow tie: pre-tied; adjustable fit. Silk; dry clean. Made in Italy.